Sarah Ball, second year Ph.D. student in the Health, Exercise Science, and Recreation Management Department at the University of Mississippi, has given a lot of time to volunteer work. Currently, she is director of Volunteer Oxford and has helped with many local nonprofits. “In my school program, we have a lot of volunteer opportunities that students can participate in,” Ball said. Her enthusiasm for volunteer work recently earned her a nomination for the Algernon Sydney Sullivan Award by UM’s McLean Institute for Public Service and Community Engagement. Established in 1890, the award honors individuals who exhibit nobility of character that is exemplified by selfless service to others and the community. 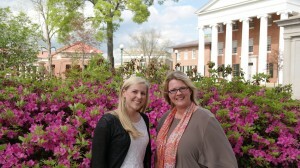 Ball was recognized as a finalist for the award at the Inn at Ole Miss. Members of the community were in attendance, as well as Chancellor Dan Jones. Ball also learned she was nominated by fellow Ph.D. student Mary Amanda Haskins. Alongside the Sullivan Award nomination, Ball also received an award from the Society for Public Health Education earlier this year. The organization promotes healthy behaviors and environments through its membership, and the award will provide financial support for Ball to attend the 2015 SOPHE conference in Portland, Oregon. As for the future, Ball recently completed a multi-stage study involving sleep research. She will begin examining the data from the study this summer.